This module connects to a Sick Bulkscan LMS 511 device. It allows the user to configure some of its parameters and to retrieve the data sent by the device. First, the user needs to establish the connection with the device, by filling in the corresponding IP address and port in the IP Connection page. These settings should be previously configured with the Sick SOPAS Engineering Tool available on the manufacturer's website. The connection can be initialized manually, by pressing the Connect button or automatically, if the Reconnect at Startup option is selected. 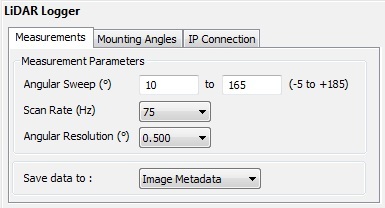 Then, in the Measurements page, several parameters can be adjusted: Angular Sweep, Scan Rate and Angular Resolution. Each time one of these parameters is changed, the new configuration is sent automatically to the device. Sometimes, reconfiguring the device might take a few seconds. The data captured from the device can be saved separately in a log file and/or as metadata, embedded in each recorded image. When saving to a log file, the module creates a text file in the same folder as the recorded sequence, AVI, MOV or image files and is using the recorded file name with a "_lidar.txt" extension. If the destination media for recording is RAM rather than disk, the file is created in the C:\temp folder and is called "RAM sequence_lidar.txt". 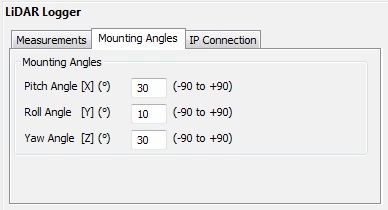 The Mounting Angles page allows the user to fill in the angles at which the device is mounted. These parameters are also saved along with the data received from the device.